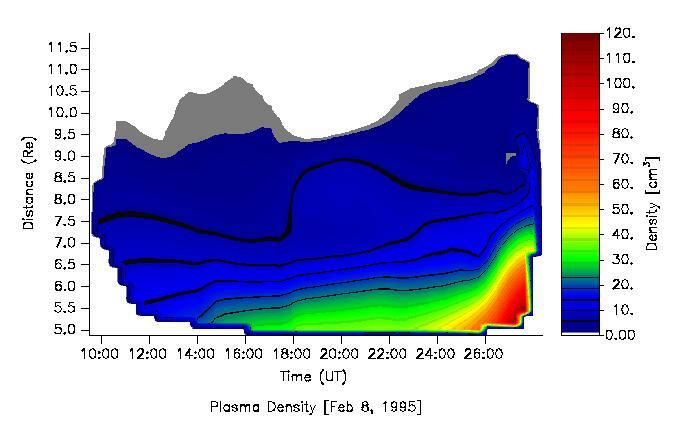 Ultra-low frequency (ULF; 1-100 mHz) field line resonances may be used to remote sense the plasma mass density in the magnetosphere as a function of both time and radial distance. 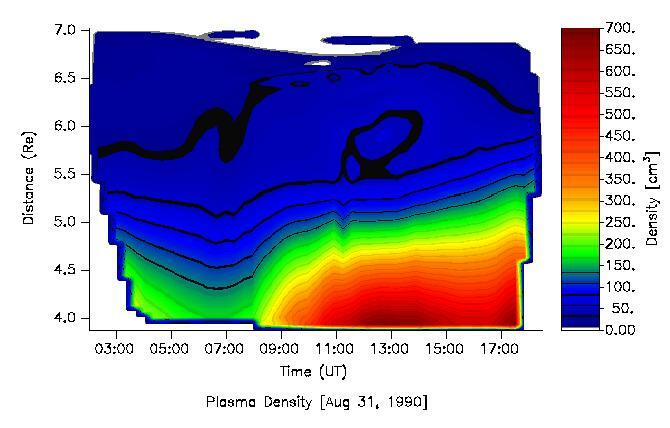 A particular type of plasma wave in the magnetosphere has its energy guided along the magnetic field. When it encounters the ionosphere, the energy reflects back into space. At the appropriate frequency, a field line resonance (FLR) is formed. 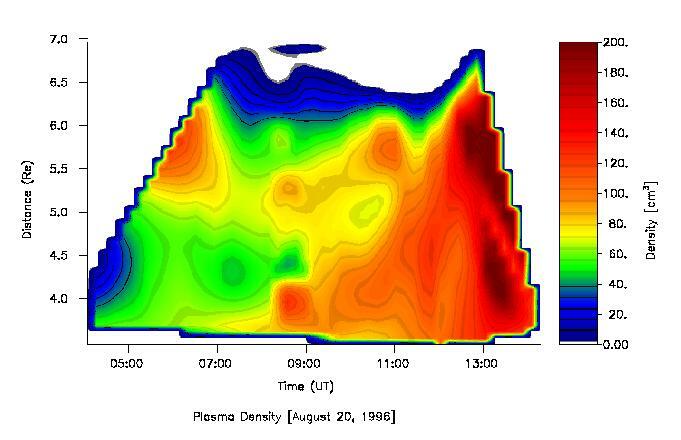 The basic idea for remote sensing is to detect the resonance signature of these resonant low frequency plasma waves. 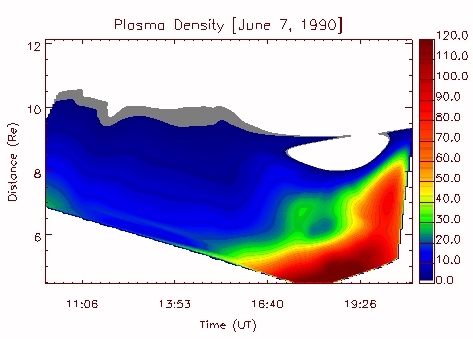 This information may then be used to estimate the plasma mass density in space. SAMNET at Lancaster University, UK. Solving the wave equation requires the magnetic field topology be known. 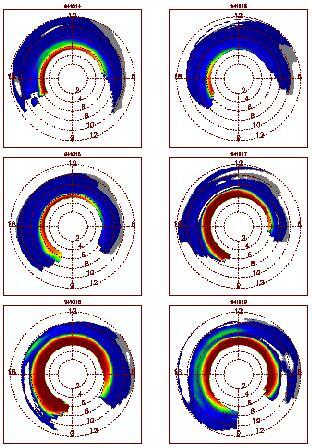 At low latitudes we use the IGRF and for high latitudes we use the IGRF with the Tsyganenko models. 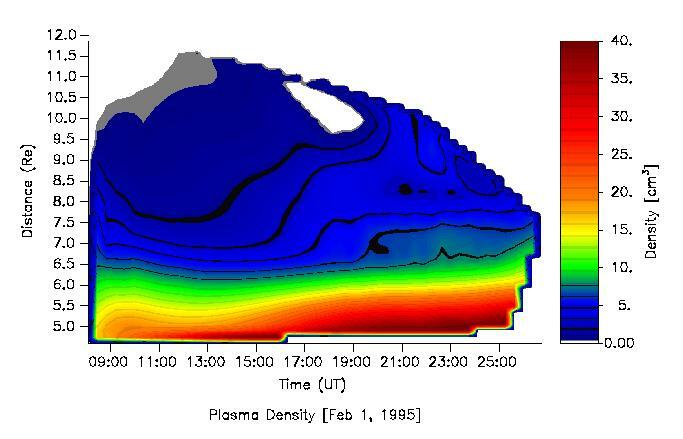 The integration of the Tsyganenko magnetic field models was done in collaboration with Dr Eric Donovan, now at University of Calgary. 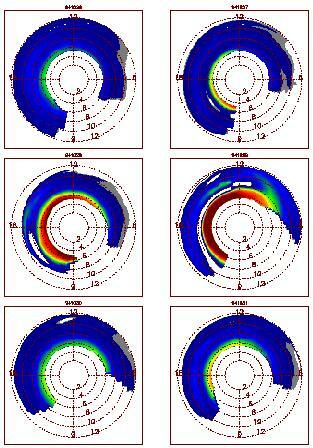 This work was reported in J. Geophys. Res., 101, p24737, 1996 Abstract. 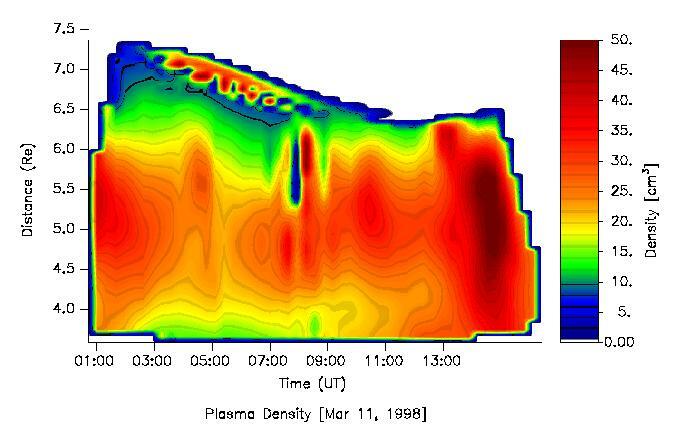 (a) Magnetometer data from CANOPUS, Canadian Space Agency magnetometer array [Churchill line data provided by Prof. J.C. Samson] may be used to find the FLRs. 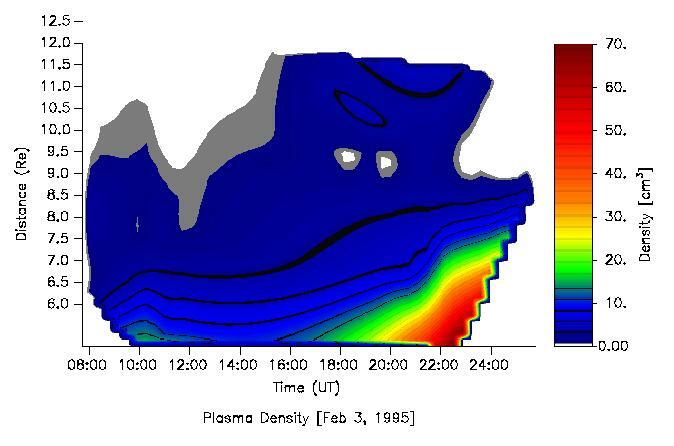 The plasma density plots are calculated assuming the Tsyganenko, 1989 magnetic field topology. 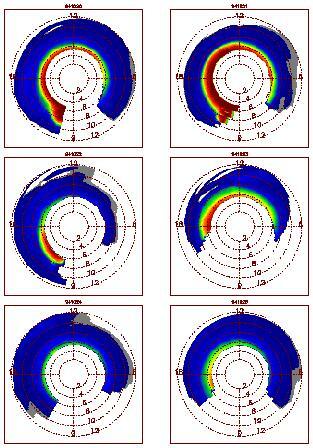 (b) Magnetometer data from the IMAGE and SAMNET arrays may also be used. These intruments are uniquely placed to remote sense the plasmapause. The second type of plots are in polar coordinates. The ULF data come from different research groups who need to apply for funding in order to keep their instruments working. Please visit and read any rules these groups have regarding the use of their data. 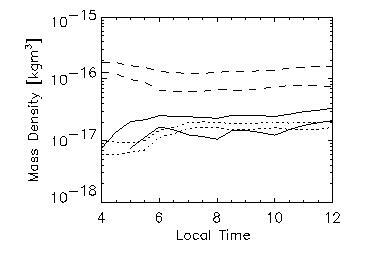 The high latitude data is easier to calculate compared with the low latitude data. The low latitude estimates are calculated by solving a non-linear scheme which requires a certain amount of trial and error to get it to work. 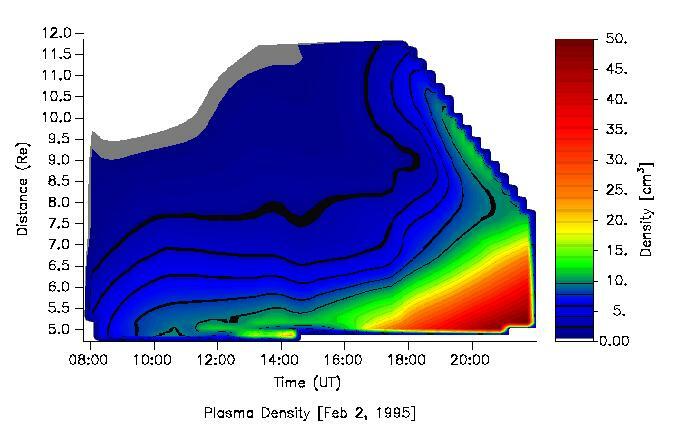 We can only provide plasma mass density estimates if we can detect ULF resonances for your particular interval. This technique is usually limited to the local daytime although occasionally the ULF resonances can be detected in the predawn hours.